Domain Market Review 2019: Is Domain Market a Good Hosting? Since 2010, Domain Market has been providing web hosting services to hundreds of businesses based in Greece. The vendor offers a variety of hosting services, including shared hosting, reseller hosting, and dedicated servers solutions. Domain Market is a Greece-based company that began operations in 2010. During this time, the vendor has grown its customer base to well over 16,000 and has registered more than 19,886 domain names. Its main focus is offering shared hosting, reseller hosting, and dedicated servers solutions to its customers in Greece. The Domain Market website is only available in Greek. Domain Market’s data centers are under 24/7 observation. They are connected to a fast backbone network of up to 10 Gbit/s ensuring that their servers operate at optimal speeds. The vendor’s web hosting solutions operate on servers powered by SSD or NVMe SSDs drives. The SSD technology gives users better performance on their webpages with up to 200% faster loading speed, faster caching, and faster queries on databases. This hosting firm offers free daily data backups that are performed by an external backup server for easy file retrieval in case of a disaster. In addition, it offers paid managed backups, which come with an option to choose your offsite file and data backup retention. Domain Market’s hosting solutions use the user-friendly cPanel 11.76 or the Plesk Onyx control panel. These two upgraded versions of control panels are easy to use and come with Softaculous one-click installer with more than 300 pre-installed scripts, including popular ones like WordPress, Joomla, and Drupal. While the Domain Market website looks pretty typical, the design and organization allows users to navigate it with considerable ease. Domain Market’s shared hosting plans are relatively cheap. However, its VPS and dedicated server solutions are somewhat expensive compared to what other vendors are offering in the Greek market. Prices are offered in euros, and clients can commit to pay monthly, yearly, or once every 24 months. The company offers free website transfer and incredible discounts that are extremely rare in the hosting industry, such as several months of free hosting. Additionally, the vendor has seasonal discount coupons for first time clients. Domain Market offers an uptime guarantee of 99.9% and an almost unheard of money-back guarantee of 100 days. Clients can contact the Domain Market customer support team by telephone, email, ticketing system, or live chat support. Its customer support team is available 24/7/365. 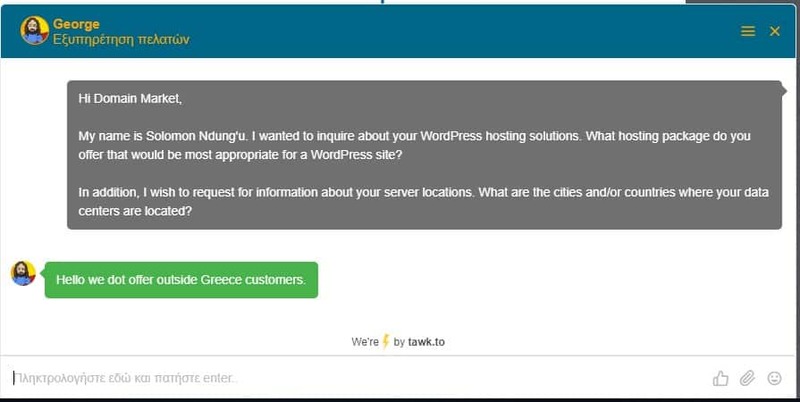 While the vendor never responded to my support email, I did talk to one of its live chat support reps who told me that its hosting solutions are unavailable to users outside of Greece. Unfortunately, the support team came across as impersonal and passionless, and the vendor’s website has no knowledge base either. For small businesses and startups in Greece, Domain Market’s cheap hosting solutions and feature-rich packages make it a suitable vendor. However, while the vendor still offers decent solutions for VPS and dedicated server clients, the high price tags can keep many potential customers away. What’s more, its impersonal support team does nothing to improve the situation. 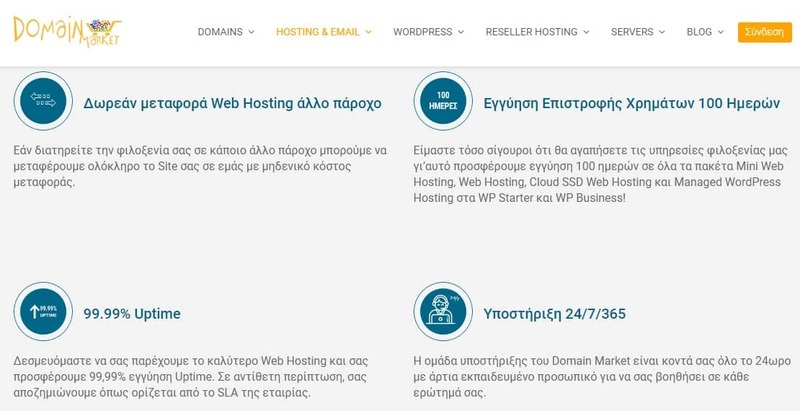 All the same, for business organizations in Greece, Domain Market makes for a pretty decent hosting provider. Wondering how Domain Market stacks up against other Web Hosting companies? Enter any other Web Hosting company and we will give you a side-by-side comparison.